Home Costs > How Much Does It Cost to Replace a Sliding Glass Door? If your sliding door is drafty, leaks or it doesn’t shut properly, then it may be time to call in the professionals to replace it with a new one. If you have ever walked into a hardware store, you probably already know you can choose from a wide variety of sliding doors, which is the main reason the costs can be all over the place. A very basic sliding glass door, without professional installation, can cost $300 to $500, and this is the type of door most people think of when they hear the term sliding glass door — a six-foot pair of plain glass panels inside a simple frame. An eight-foot door can run $800 to $1,200 without professional installation. Lastly, a pre-hung door, which is when an entire unit needs a hole in the wall in order to install can cost $1,000 to $3,500, depending on the glass and features. These are all costs for a sliding door without professional installation. Since all jobs can vary, consider getting three to five quotes for free by simply describing your job. If you were to have it installed by a big box retailer, such as Home Depot, for example, the costs, at least according to our research, would be about $39 to have them measure, $85 to deliver the door and another $500+ to install the door. This wouldn’t include the cost of the door, and the costs, in the end, would greatly depend on the factors mentioned in this guide. As for professional installation, the costs will depend on the setup. If the sliding glass door needs to be simply swapped, then it will be much cheaper than a sliding glass door that needs a new hole cut into the wall. If you are simply replacing the sliding door and the structural work has already been done, the labor will cost about $250 to $400 as long as no alterations need to be made and no permits will be required. Adding in the cost of a basic sliding door, your door, plus the installation, can cost about $850 to $1,800 for a straight-forward install without any alterations. In the end, the materials the sliding door is made of can greatly affect the pricing. An aluminum door, for example, can be half the price of a stained solid wood patio door. Angie’s List says a vinyl or aluminum patio door will often be your cheapest option available, and for a basic install, plan on spending anywhere from $1,200 to $2,500 at a local big box retailer. A gliding sliding door with much better insulation properties can cost much more, usually around $2,500 to $5,000. A few members discussed this very question on Apartment Therapy and said they had paid anywhere from $1,100 to as much as $4,000 to remove an old door and install a new one. The most common types of material on the market includes wood, vinyl and fiberglass, and each material, depending upon the one you choose, will be available in a range of styles and features. Wood patio doors can be expensive, but it’s a natural choice can create a traditional style. Vinyl, on the other hand, can look like wood but it won’t need as much upkeep. Fiberglass, created from a glass-like material, will be designed to look like wood but will require next to no maintenance. Like a doorknob in your home, a patio doorknob can be upgraded, which can, on average, cost $20 to $50, depending on which kind of knob you want to purchase. Patio doors can also have blinds built within the glass, allowing you to have privacy with a simple single-hand operator. Lastly, the screen door, which allows fresh air in without the pests, can be added to a track if the door doesn’t come with it. Patio doors will have various energy efficiencies options such as Low-E coatings, a gas fill or ENERGY STAR certification. Low-E coatings will reflect any infrared light, keeping the heat inside in the winter and the heat outside during the summer, while gas-filled, either Argon or Krypton, can be placed in between the glass panes to offer better insulation. Lastly, the ENERGY STAR certification, a government-supported program, will have specific criteria to define how a patio store can be certified as such. This will be done by measuring the glass, gas, space and reinforcement. The combination of these factors will then determine the door’s U-value and solar heat level, which in turn, determine if it qualifies for the certification. The cost breakdown, mentioned above in our bullet point within the cost section, should include the door set, sliding screen if you need one, the materials and the labor. The length of the warranty will depend on the manufacturer, but according to our research, most limited warranties vary between 10 to 15 years. Removing an older sliding glass door and replacing it with a new pre-hung door is a relatively straight-forward process. Usually involving two people, the interior trim will be removed first, followed by lifting the pane out. Next, the panels will be removed, followed by the exterior trim, jamb and the frame. The opening, once the door has been removed, will be clean of any debris left behind. The entire process should take less than a day to complete. A customized door, on the other hand, could take more work since alterations in the framework may need to be done if it doesn’t fit the specifications. Adding a new sliding door and/or making alterations the outside of your home will often require a permit from your local city. Check with your local government to know what you will be responsible for. However, if it’s a simple replacement, you won’t need a permit most of the time. 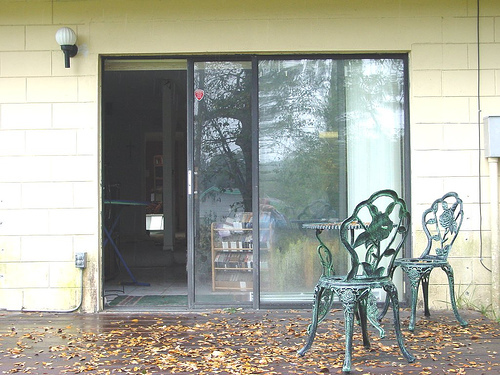 Some contractors may charge $100 to $200 to remove and dispose of the old sliding glass door. If the floor, siding, deck and/or the interior is damaged or needs to be replaced during the job, it could cost an additional $50 to $500+, depending on the extent of the damage. Get several estimates before choosing a contractor. If it’s a straight-forward job, most contractors should be able to offer a ballpark estimate over the phone or via email. In some cases, your sliding door can be repaired rather than installing a new one. If the sliding mechanism is stiff, for example, new rollers can be installed, making it slide like new again.